A judge in the Italian city of Parma has ordered Parmalat's founder, Calisto Tanzi, and other former executives to face trial over its collapse in 2003. Judge Domenico Truppa charged 23 people with fraudulent bankruptcy and criminal association. The Parma trial, Europe's largest corporate bankruptcy case, is the biggest and most important of several legal actions linked to the dairy firm. 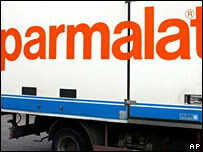 Parmalat was restructured after its 14bn-euro ($18.6bn; £9.4bn) collapse. One of the key issues has been how individuals linked to the firm helped hide the true state of its finances, as it faced mounting debt. Thousands of individuals have lost savings after they invested in Parmalat bonds. As well as Mr Tanzi and Mr Tonna, Giovanni Tanzi - the founder's brother - and Parmalat's former marketing director Domenico Barilli, have also been ordered to stand trial. If the former executives are found to be guilty in the Parma case, the bondholders might be able to seek damages worth billions of euros. In a separate case, Mr Tanzi and 15 other individuals from the firm already face charges of false accounting and misleading the Italian stock market in a trial in Milan which began in September 2005. And in June, a judge in Milan accused four international banks - Citigroup, UBS, Deutsche Bank and Morgan Stanley - of not developing the necessary measures that would have improved Parmalat's situation. Mr Tanzi, who has pleaded for forgiveness, has repeatedly said the banks were to blame because they encouraged the sale of bonds.